At this point in our cultural landscape the reaction one has to the latest film set in J.K. Rowling’s wizarding world is largely dependent upon your history and affiliation with said wizarding world. It’s difficult to even comprehend the amount of lives Rowling’s work has impacted and become a major component of since the Harry Potter franchise became a worldwide phenomenon nearly two decades ago. The plan for the Fantastic Beasts franchise, outside of continuing to make money off the brand, was to hopefully introduce a new, younger generation to this world through new stories while naturally entrancing those who came to the world of muggles and magical folk in real time. Harry Potter has now been a part of my life longer than it hasn’t-twice as long nearly-and so, it is always with great anticipation and interest that I approach anything Rowling does even if the cultural temperature is a bit cooler than it used to be. Though initially pessimistic towards the idea of expanding the Potterverse via New York City in the twenties and based around the guy who wrote one of Harry and his friend’s textbooks, Fantastic Beasts and Where to Find Them turned out to be a rather charming introduction to a new facet of this world we only thought we knew; casting a strong enough spell to leave audiences wanting more adventures in the life of Mr. Newt Scamander (Eddie Redmayne). With Fantastic Beasts: The Crimes of Grindelwald Rowling and franchise director David Yates (the last four HP films as well as the first Fantastic Beasts movie) pick up the story they started two years ago some three months later in a sequel that ultimately serves as a series of revelations for the series’ main players while potentially changing everything we know about one of the Potterverse’s most important characters. The fact the franchise has moved and is moving in the direction of utilizing more primary Potter characters is a double-edged sword given it's hard not to want to see familiar aspects of this familiar world, but there is something of a greater desire to see an aspect completely independent of the events and characters in the Harry Potter stories so as to not potentially spoil what we already love. In other words, while I’m all in for further exploration of the magical world mythology and continuous world-building Rowling is so good at the fact of the matter is The Crimes of Grindelwald might have been more consistently engaging if it’d found a more entertaining story through which to convey these new developments. 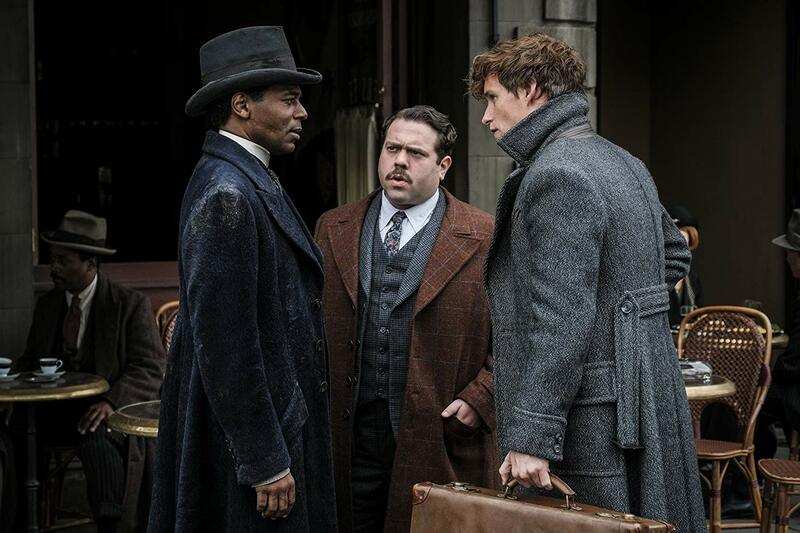 Arnold Guzman (Cornell John) may be of some help to Newt (Eddie Redmayne) and Jacob (Dan Fogler) as the two escape to Paris to try and track down their girls and Grindelwald. In this sequel, Redmayne's Newt is back in the U.K. having been banned from international travel following his exploits in the previous film. Viewers are rather awkwardly introduced to Scamander's brother, Theseus (Callum Turner), who is an Auror at the British Ministry of Magic (which you have to remind yourself you haven't seen in this time period, yet) as well as becoming privy to the fact he is engaged to Newt's former love, Leta Lestrange (Zoë Kravitz). Newt will continue to be banned from traveling and fulfilling his desired work abroad unless he adheres to certain stipulations that it seems Theseus has bargained with the council to agree to. Theseus' hopes are that Newt's desire to be able to leave the U.K. are strong enough that he might agree to the conditions of joining the Ministry as an Auror in order to track down Credence (Ezra Miller), but Newt isn't open to the idea of choosing sides as the finale of Fantastic Beasts taught the magizoologist that there was more to this Credence than your average archetypal villain. 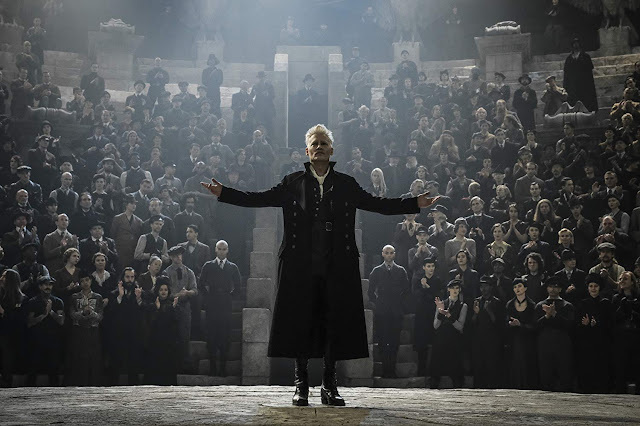 And though Newt isn't open to helping his brother given the conditions of the Ministry, his alignment to Credence and Gellert Grindelwald (Johnny Depp) is not over yet. Following Newt's meeting with the counsel at the Ministry he is quickly approached by a young(er) Albus Dumbledore (Jude Law) who asks Newt to track down Credence in his stead before Grindelwald can get to him. If you thought you remembered Colin Farrell's Graves turning into Johnny Depp at the end of the previous film and being arrested by the Magical Congress of the United States then you would be correct, but if you don't remember that Depp is supposed to be the franchise's big antagonist and that the reveal that Graves was in fact actually Grindelwald you would be forgiven. The point being, Depp is indeed Grindelwald and he is a bad, bad dude (Grindelwald, not Depp-at least in this case) that, in the opening sequence of the film, escapes the clutches of the MACUSA and takes up residence in Paris (in a scene that makes it pretty clear Grindelwald is more of a ruthless villain than Michael Myers) where he begins summoning his followers in order to entice Credence to join him in his desire to create a global order that would dominate Muggles. And so, while the Ministry is on Credence's trail, so is Newt via Dumbledore, as is Grindelwald which only means this thing is heading towards a third act where the main players collide. What takes me most out of these movies and by these movies I mean the Fantastic Beasts films, is wondering how they might be received had they too been based on a beloved series of novels rather than Rowling only sketching out the series in a five film arc and delivering them through the cinema. Would The Crimes of Grindelwald then be criticized for lacking as much in character growth or plot development? Sure, it's fair to argue that many of the characters and even Depp's villain are largely in the same place at the conclusion of this film as they were at the beginning with a few notable exceptions, but as Harry, Ron, and Hermione obviously grew in certain, different ways each time they returned to Hogwarts for a school year Rowling has shrunk the time in which this new series is taking place and so, while the characters may not necessarily evolve in such notable ways they are certainly learning new things and, at the very least, having to adapt more frequently and arguably-to greater degrees. That isn't to say The Crimes of Grindelwald is as calculated a piece of work as any one of the individual Harry Potter novels, but it is to say that it seems these films are maybe too hastily judged and might possibly be looked upon with much more fondness and a greater respect not only in time, but once the entire picture comes into view. With the Harry Potter franchise, there was this relief the movies felt in not having to deliver revelations as the books beat them to it every time thus meaning while audiences were anxious to see the film adaptations of each new novel they weren't dependent upon the film franchise for each new revelation whereas Fantastic Beasts is, well...a completely different beast. To this extent, it can't help but seem that The Crimes of Grindelwald will ultimately come to feel misunderstood with future generations who devour the whole of the Fantastic Beasts films in one sitting (hopefully) regarding them as something if not comparable to leaving them with the same feeling the Harry Potter films did at least being another immensely entertaining chapter in the wizarding world saga as opposed to those of us witnessing the evolution and release of the films in real time who are simply clamoring for little more than the revelations that come to pass and not appreciating the depth or texture these films contain. All of this is to say that, while The Crimes of Grindelwald undoubtedly has its shortcomings I rather appreciated the deliberate pace and consistent need for Yates to allow each shot to feel like it has the biggest scope possible-even if it only features little more than one of Newt's littlest creatures. Oh, and if you think James Newton Howard is simply riding the coattails of John Williams, Alexandre Desplat, and the others who composed music for the Harry Potter films then you might take a listen to the score apart from the unbelievably imaginative visual element. Johnny Depp nastily portrays the titular Grindelwald in Fantastic Beasts: The Crimes of Grindelwald. So, yes, Crimes of Grindelwald is a piece of a much larger puzzle, we're all willing to accept that, but that doesn't mean the film should function different from any other film in that it needs a well-defined beginning, middle, and end rather than feeling as if it only serves to connect one film to another. In some ways, there is this sense-especially in the case of the titular Grindelwald. This very vague wizard for whom we still don't know any motivation has existed thus far as little more than to fill the role of a "big bad" in the vein of Voldemort, but at least Voldemort had a very clear and critical connection to our main character. With Grindelwald, the intriguing backstory and connection comes not through Newt (which is an understandable choice so as to not mirror HP too much), but instead through the life of Dumbledore where there is very clearly a complicated past between the two (and it should be noted how good Law is in his limited contribution here). While shades of this relationship between Dumbledore and Grindelwald begin to come into focus in this second chapter there is still much left to be desired about the tangible connection between these two legendary wizards and how they diverted into two very different paths. While the sequels will no doubt outline this further (only pushing Scamander further to the side, I presume) it is certainly one of the major faults of the franchise so far that we're five hours in and still have no real sense of who this villain is. The development of the antagonist has more been devoted to that of Miller's Credence (over both of the first two films), which would be fine if Credence were more of an interesting character. Miller has more than proven he can be a captivating and quite disturbing screen presence (see We Need to Talk About Kevin) when the script gives him something to chew on, but while his character seems poised to play a major part in the overarching narrative his portrayal thus far has inspired little more than slight sympathy. As the character of Credence gets more air time here along with new friend, Nagini (Claudia Kim), the prominence of leading characters from the first film such as Newt's potential love interest, Tina (Katherine Waterston), Tina's sister Queenie (Alison Sudol), and the still star struck Jacob (Dan Fogler) have been given noticeably less screen time. It is through the ever-expanding roster of characters that it's becoming more and more clear Rowling may be juggling a little too much this time around-wanting to break away from characters who may have roots in her original works, but unable to avoid them forever given the influence many of her past characters likely had in the wizarding world in their prime. The reduction of the core quartet's time together really is a shame though, as the dynamic between this group was one of the strongest elements in the first film; this being particularly true of Fogler's Jacob as Rowling doesn't seem to know what to do with the character here at all. Alas, it seems Jacob's ultimate path may not be the light in a time of darkness it seemed to be at the conclusion of the first film given a surprising if not completely justified twist on one of the other central characters. Furthermore, the inclusion of new character Arnold Guzman (Cornell John) who exists as the US Emissary to the International Confederation of Wizards along with Kravitz's Lestrange seem to exist only to further complicate the plot rather than enhance it. Grindelwald does become unnecessarily convoluted in its third act with large dumps of exposition, but it's not the revelations that are upsetting, rather it is more how Rowling has chosen to have them unspool in her narrative. 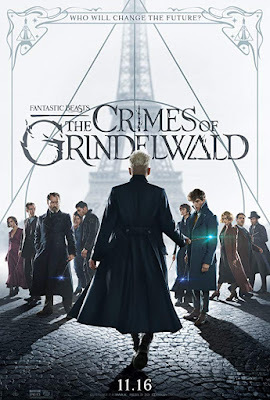 While constantly comparing this series of films to Harry Potter is good for no one it is also an inevitability and while it is nice to see Fantastic Beasts taking on a completely different time period and (mostly) new characters it is with great hope that The Crimes of Grindelwald is the last in this series that feels the need to deliver news at a lightning quick pace leaving the planned next three films to really be able to bask in the expansion Rowling clearly has planned.